A team can never have enough offense and right now the New York Yankees are practically working without one. As the MLB First-Year Player Draft is set to begin Thursday, a competent bat becomes available without draft pick compensation attached; Kendrys Morales. 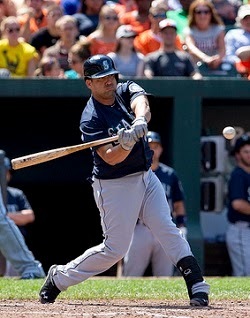 Morales, a switch-hitting first baseman and designated hitter with power, was left to wait after the Seattle Mariners gave him a qualifying offer and not a single team bit due to the loss of a draft pick accompanying his signing. He has been linked to several teams including the Yankees. Morales (.277/.336/.449 with 23 HR in 2013) will be looking to sign for the pro-rated $14 million contract he could have accepted from Seattle during the offseason. The fit for the Yankees seems obvious if Mark Teixeira was to suffer a long-term disabled list stint due to his surgically repaired right wrist which has flared up in recent weeks. But, with Teixeira back in the lineup Tuesday and launching his 10th home run of the season, is there a spot for Morales? Morales will want to sign with a team who will play him every day. He has less than two-thirds of the season to showcase his worth once he hits free agency again this offseason. He will not want to be a part of a platoon or used as a random fill-in. Can the Yankees give Morales enough at-bats to satisfy his desires? I say yes. In my view Morales could receive plenty of at-bats between resting Teixeira at first and then garnering the rest as the DH. Plus, there will always be the potential for Teixeira to suffer another setback and the crew that has tried to hold down first base for the Yankees has been underwhelming. What about the current DH shuffle? Don’t the Yankees need to rest certain players and find at-bats for others? Yes, they do, but the rest does not have to come at the expense of using several different hitters in the DH capacity. In fact, it can be argued that eliminating the shuffle would probably help the team in the long run. Here’s how to eliminate the DH shuffle in the Bronx if Morales is brought aboard. While Carlos Beltran, another switch-hitter, is due back at the end of this week after three-plus weeks on the disabled list due to a bone spur in his right elbow, it’s a certainty he’ll need his days off along the way. Full days of rest would be more beneficial at this stage for an aging and oft-injured player; one every seven days seems reasonable enough. Jacoby Ellsbury should be playing every single day. Having him sit because he’s had injury problems in the past makes no sense. He’s not recuperating from any maladies, so he should be out on the field every day. It makes the defense better and keeps him in a rhythm at the plate. If the Yankees insist on resting him say every 10 games, give him the entire day off. If Ellsbury sits, Brett Gardner moves to center and Ichiro Suzuki can play left. That provides Suzuki with at-bats by spelling either Beltran or Ellsbury. Ichiro is thriving in a limited role and I don’t think the Yankees should change their approach with him. As for Alfonso Soriano, he has been dreadful at the plate (.226/.253/.392) so taking plate appearances from him at this point would be a welcome change of pace. I’d go so far as to say he could be kicked to the curb with no harm done to the Yankees. If someone wants Soriano, the Yankees should be all ears. What about getting Derek Jeter half-days? Ditch the idea. While I love Jeter and everything he has meant to this organization, he’s not providing much in the way of offense this season (.260/.322/.311). He’ll be better served by having complete days off from here on out. It doesn’t even matter when Jeter’s days are factored in as he’s generated a .632 OPS against lefties and .634 OPS against righties; though hard-throwing right-handers dispose of Jeter easily these days. Finally, the Yankees have been giving Brian McCann some days as DH as well and this makes some sense. While he’s been in a season-long slump, there should come a time when he snaps out of it and the more appearances he receives at the plate the better. When Teixeira rests, preferably when a righty is on the mound as Teixeira’s wrist is more of an issue as a left-handed batter, Morales can play first and McCann, a lefty hitter can DH. McCann is about the only other player I would want to be receiving at-bats as DH if Teixeira is healthy. And that’s key here; Teixeira’s health. All of this is moot if Teixeira wakes up Wednesday and his wrist is inflamed or causing discomfort. Then the Yankees have to make a strong push for Morales in my opinion. But, the Yankees should not take a wait and see approach based on Teixeira's availability where it concerns signing Morales. There is too much competition for Morales' services to sit back and the Yankees have room for him. In the end, Morales could be a significant boost to the offense and ridding the DH shuffle might provide some stability to the lineup and still offer rest days for the veterans.